“Single field”, the term that we use in English to describe our non blend teas from Uji, is a direct translation of the Japanese term 単一畑 or “tan itsu batake”. The literal, word by word translation of this term from Japanese to English would be “Only one Field”. Rishouen single field teas are composed of small batch spring harvests leaves sourced by our tea master directly from trusted producers in prestigious Uji tea growing regions such as Wazuka, Harayama, Dosenbo, Shirakawa or Kyotanabe. These teas contain leaves of a single cultivar (tea variety), grown in a single field, by a single producer. As such, they each have a unique character representing the undiluted message of the soil, rain, and climate of the soil the field they were grown in, as well as the skills and care of their producer. The pricing listed below is the retail format meant for private orders. Please do not hesitate to contact us by e-mail should you wish to learn about single field teas available in wholesale format for international shipping. Kyotanabe, in the Kyoto prefecture, is renown for its production of high quality Uji Gyokuro revealing a deep umami mellow flavor. The Gokou cultivar hails from the Kyoto prefecture. 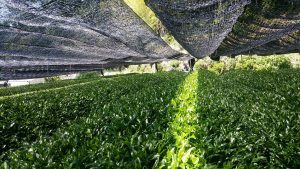 The shading of the fields before harvest to obtain umami-rich teas is a production method originating from Kyoto, so it is not a surprise that many of the varieties created in the Kyoto region are meant to be used for the production of shaded teas. 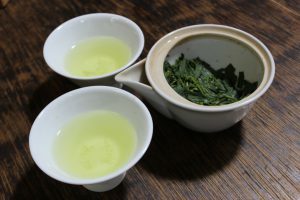 (Gyokuro, Kabusecha, Tencha). Within the varieties meant for shaded tea production, the Gokou variety is one of the cultivars offering the best results. 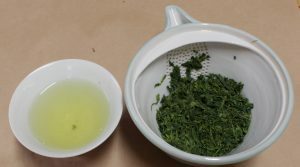 The Gyokuro produced by Mr. Yoneda is hand picked, meaning that only the most tender leaves are taken from the trees in spring to produce this tea. The tea trees are not trimmed to fit the shape of a harvesting machine: they grow freely (except for a trim made after the spring harvest) and are harvested only once a year. This means that both the producer and the trees give everything they have to produce the best quality tea each spring. After infusion, this high end Uji Gyokuro reveals a wonderful fresh fragrance of ripe fruits typical of the Gokou cultivar. A few drops of its velvety light green liquor are enough to feel a firework of sensations, including refreshing floral notes and a deep, rich, yet elegant and not overpowering umami, lined with a light undercurrent of pleasing astringency in the finish. Shirakawa is a most famous in the Uji region as an excellent Gyokuro growing location producing teas possessing a most elegant shaded tea fragrance . This Gyokuro produced by Mr. Shibata is hand picked, meaning that it contains only the most tender, youngest leaves situated on top of the tea trees. Furthermore, this tea comes from a field that is harvested only once a year in spring. Consistent with is origin in Shirakawa, this tea reveals a beautiful fragrance combining fresh steamed greens, fruity and oceanic notes. The lightly colored liquor is thick and smooth, soothing, and refreshing, with a buttery feel and powerful sweet, savory undertones. Tana Oishitaen production method ( undirect, one layer vinyl cover on a shelf supported by aluminum poles at about 2 meter from the ground). Mechanical harvest. Shading period before the 2018 spring harvest: 25 days. 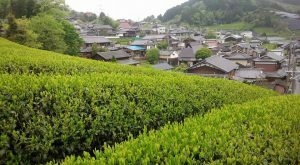 Uji Tawara is composed of hilly terrain which beneficiates from the proximity of the Uji river, and perfect climate for tea production. As such, Uji Tawara is one of the major Uji tea growing areas. This region is known for quality mechanically harvested Gyokuro. Mr. Ookawa is a young producer working with his parents on their family estate. This tea family has an original way to decide when to start shading the leaves: they add up the highest temperature of each day following the sprouting of new leaves in spring. The time for harvest is also decided based on the temperatures during the first harvest season. 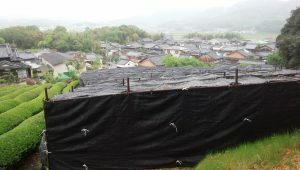 They unfold the vynil cover that will shade the trees from direct sunlight when the total sum of highest temperature for each day after the appearance of the sprouts reaches 200 degrees. 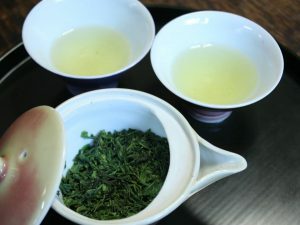 The Gyokuro produced by the Ookawa family offers the fresh fruity fragrance typical of the Gokou cultivar, along with a full and rich, supple liquor revealing a strong umami, with a refreshing fruity flavor and a long finish. The ‘Yumewaka’ cultivar originated from Sayama in the Saitama prefecture. Mr. Hata Koudai is the only producer owning a field planted with this cultivar in the Kyoto prefecture. Mr. Hata Koudai ‘s estate is located in the Kamatsuka district in Wazuka town. There are many tea families called ‘Hata’ in the Wazuka region, so we are specifying Mr. Hata’s personal name ‘Koudai’, on top of his family name ‘Hata’, to differentiate him from other local producers who share the same family name. 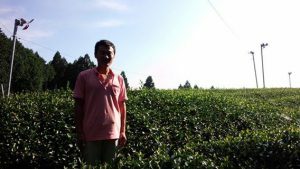 This young producer has an extraordinary passion regarding tea production. Mr. Hata is recognized by professional tea buyers at the Uji tea market for the quality of his tea, and the number of tea producers of his level might be counted on the fingers of one hand. The Kabusecha we obtained from Mr. Hata was shaded steadily 16 days before harvest. The leaves offer a milky flavor and are packed full with a tight, strong umami flavor. 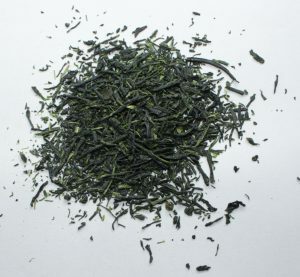 As a non blend, single field tea, this Kabusecha possess a truly unique personality. This is a tea corresponding to the saying often mentioned in the world of Japanese teas: 一期一会 (Ichi go, Ichi e), ‘One time, one meeting’. Such a low price for a tea of this quality is a steal. Okumidori is a late budding cultivar with a mellow flavor and reduced astringency registered in 1974 in Shizuoka. This variety results from the crossing of the Yabukita cultivar and the Shizuoka native variety n°16. This is grown in the chief Uji tea production location, Wazuka, by an outstanding farmer: Mr. Nishikawa, now 43 years old, who manages his estate with his family of 3 people. The sandy soil on which the tea trees grow is soft, allowing the roots to grow deep into the ground and carry varied nutrients to the leaves, resulting in a rich flavor in the finished tea. Due to Mr. Nishikawa’s masterful production (fertilization, protection from pests..) and shading processes, this Kabusecha reveals a fair and mellow liquor, and might be mistaken for a Gyokuro due to its incomparably deep Umami savory notes. 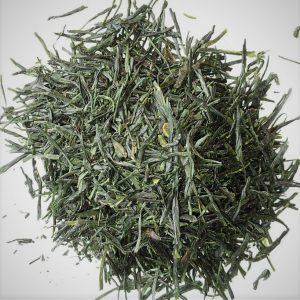 This specialty tea composed of leaves of the Yabukita cultivar was grown for us in a single field by Mr. Tsuji in Harayama – a sharp hilled district in Wazuka known for producing some of the best Sencha of the Kyoto region. The field yielding the Sencha Yabukita Kin Jirushi is situated at a 200 m altitude on an ideal tea producing location on a riverside, at the bottom of a ravine. This location experiences the high day / night temperature difference shaping mellow flavored teas. 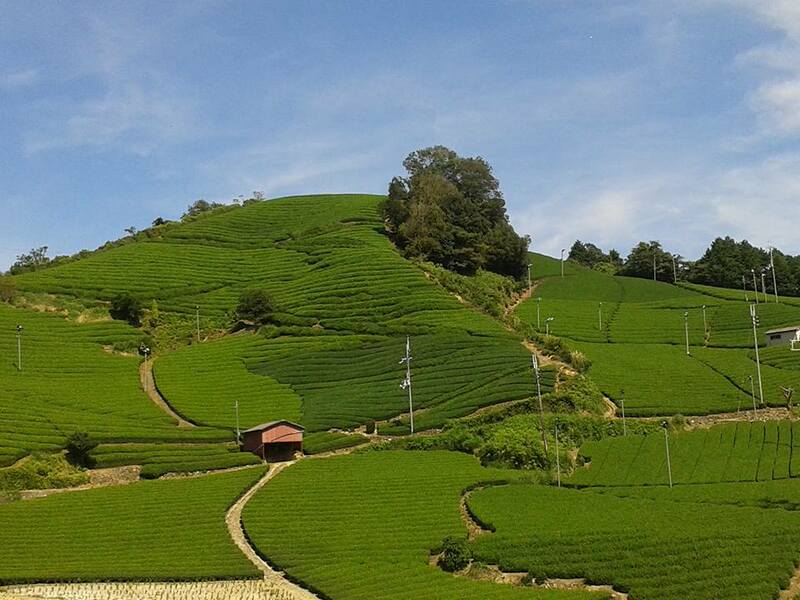 (Our tea master asked Mr. Tsuji to shade the field 5 days before harvest to emphasize the mellow character of the tea). The field is also exposed to reduced hours of sunlight and to stagnant cold air and fog emanating from the nearby river, so the leaves grow slowly and stay very tender until harvest time. 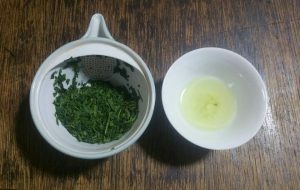 Red clay soil which retains nutrients well provides the leaves of the Sencha Yabukita Kin Jirushi with a full bodied flavor. The young leaves offer a sweet after taste, and a clear, refreshing fragrance opens up in the back of the nose in a nice retro nasal olfaction effect. 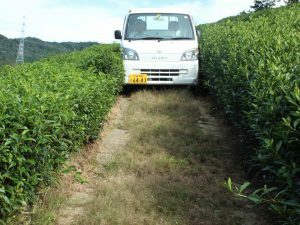 This tea is grown on a steep slope facing south by Mr. Tsuji in Harayama. The terrain in Harayama contains rock conglomerates rich in minerals, which, absorbed by the tea trees, offer a crisp, sweet fragrance to the leaves. Furthermore, the black soil in this location retains fertilizers well, allowing the leaves to offer a deep flavor lasting well from one infusion to the next. 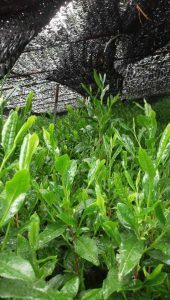 This is a ‘pure’ Sencha composed of leaves grown traditionally in full sunlight without any shading period of the field before harvest. 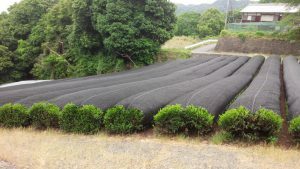 This production method is becoming rare as more and more tea producers in the Kyoto region shade their fields from the sun a few days before harvest to answer to the demand for mellower teas in Japan. 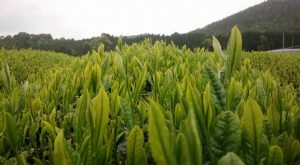 By doing so, they are producing ‘Kabuse Sencha’ — kabuse means covered, or shaded –, creating new Sencha characteristics and moving away from traditional Sencha production methods. However, there are still tea lovers who enjoy the typical fragrance and pleasing astringency of traditionally produced Sencha. 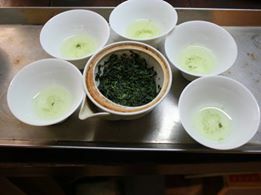 Our tea buyer and blender, Naoki Kagata, very much appreciates the flavor and fragrance of pure, non shaded Sencha, and wishes to promote them so that they don’t disappear. 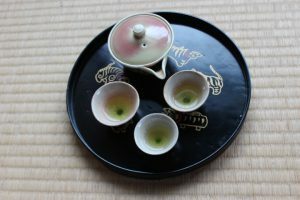 That is the reason why he has asked Mr. Tsuji, year after year, to let the leaves grow in full sunlight so that we could obtain a tea revealing the nostalgic and rejuvenating sensations offered by traditional Uji Sencha, along with the refreshing fragrance offered by pure Sencha grown in Harayama. Z1 is a cultivar that was not given a name other than the number that was attributed to the variety when it was made in the lab. It is a rare tea that is difficult to grow well, but Mr. Tamura in Wazuka grows his Sencha Z1 to perfection, and we are purchasing this tea for the second year in a row as it was very popular last year. This tea is characterized by its gentle floral fragrance and sweet flavors. International shipping available. Quotations can be provided via e-mail. Payment for retail orders is requested via Paypal.